Electroherbalism recommends the following combination dietary and herbal supplements for effectiveness, formulation, and value. This page is also known as The Supplementor. There are many single herb supplements in capsules or in bulk that are also often recommended which are not detailed below. These are discussed on the Favorite Herbs page. Almost all of the products below are widely available in good health food stores or online. Formulas are included and are cut and paste from manufacturer's data when available. Note that some products come in both capsule and tablet form. Where to Buy Supplements gives links to discount online supplement websites where most of these supplements can be purchased if they cannot be found locally. Helpful browsing tip. Clicking on the pictures of the supplements opens a new window and the window is reused depending on the vendor. Clicking on the name of the supplement or the buy it! button opens a new tab in the browser or a new window every time if using a browser without tabs. Alacer Emergen-C - Packets of powder which each contain 1g of vitamin C and minerals which effervesce when added to water, making mineral ascorbates. Easily transportable and excellent for traveling. Comes in many different types and flavors with and without sugar, including one with therapeutic amounts of glucosamine sulfate and chondroitin (900mg total) and one with MSM (1g). See the Vitamin C section for more details. Activin process Grape Seed Extract Grape seed extract is one of the so-called "super antioxidants." Activin process is one where the grape seed is extracted using non-toxic chemicals. A number of manufacturers use this patented process. Natrol makes one that is commonly available. It contains 50mg of grape seed extract per capsule. Vitacost makes a 200mg product that is a better value. One of the actions of grape seed extract is preserving vitamins E and C in the body, so it makes sense to first ensure the adequate consumption of these, then worry about additional antioxidants such as grape seed or turmeric (curcumin) extract. This product is no longer available! Description is still provided for archival purposes. See Source Naturals Proline Lysine for a similar product. Alacer Pro-Lysine Ascorbs - Good formula for providing the proline and lysine along with vitamin C that Rath and the Pauling Institute claim control and may reverse artherosclerosis and arterial plaque (see Vitamin C section). Rather expensive (but not nearly as much as Rath's proline lysine vitamin C product) unless purchased at a good discount, there are other proline/lysine combinations that can be taken with sufficient vitamin C to provide the same benefit, although this one is convenient. See the Vitamin C section for more details. Alta Magnesium Chloride is one of the only pure magnesium chloride oral tableted supplements available. Magnesium chloride may be one of the better forms of magnesium to stimulate immune function and to increase availablility when there is a problem with absorption.. Each of the medium tablets is about 518mg magnesium chloride supplying 62mg of elemental magnesium. See the Mineral Section for more information. Cardiovascular Research Ecological Formulas Reagent Quality Tri Salts Mineral Bicarbonates- Tri-Salts are carbonates and bicarbonates of calcium, magnesium, and potassium. Powder form only, but cheap at around $8 per 200g. Best supplement for immediately reducing digestive tract acidity (address the cause, though, don't keep using alkaline agents for it long term). Can help to maintain an alkaline enviroment in the body if needed. Can be mixed with ascorbic acid in water to make mineral ascorbates. Some people say this is one of the best supplements to reduce allergy problems, food and hay fever types, too. See the Mineral Section for more information. Carlson's Cod Liver OilCarlson's is the most popular brand or fish oil products and their line includes a number of products including Omega 3 and 6 oils as well as Cod Liver Oil. Cod liver oil is similar to EPA fish oil in that it does supply EPA and DHA omega 3 oils, but it does not contain as much as the average EPA fish oil, which is typically salmon, mackerel, or other EPA-rich fish. Unlike these oils, cod liver oil does contain vitamins A and D. Carlson's cod liver oil limits the amount of vitamins A and D in their product so even taking it at the full serving size of 5 gelcaps per day, it does not provide too much. Even though it is in gelcap form, it is still lemon flavored to help prevent fishy burps. Carlson's also produces cod liver oil in liquid form which may be a slightly better deal, but most people prefer using gelcaps, even when it the liquid is flavored. See the EFA Supplement Section for more information. Carlson's Fish Oil - Lemon flavored fish oil EPA/DHA supplement. Mild taste and can be used in salad dressing. Recommended by Dr. Mercola as the best liquid EPA supplement. Many people don't mind the taste too much since it is lemon flavored, but the fishiness is still apparent. For those who don't like the taste of fish, gelcaps such as Enzymatic Therapy Eskimo-3 or Vitacost Mega EFA are a better choice. See the EFA Supplement Section for more information. 1300mg EPA/DHA and 14 mg antioxidant blend. Controlled Labs Blue Up (formerly known as Blue Rhino) is described as a high potency natural testosterone booster. Since it does contain some yohimbe and caffeine, it should not be used by those with prostate or hypertension problems. Testosterone boosters are often used by body builders looking for a way to increase the effectiveness of workouts, but also by non body builders to boost free testosterone levels to provide benefits in circulation problems, libido, and other conditions that can be affected by low hormone levels. Controlled Labs Green Bulgeis mostly meant as a body building supplement, although can provide benefits to those who do not aspire to this goal. Controlled Labs does a lot of research and testing on the bioavailability of their products and Green Bulge is no exception. It contains the best absorbed and useable forms of creatine of any supplement. Creatine is used to increase strength and stamina, and this action can be used by those who are debilitated or who have a problem with insufficient ATP processes. Controlled Labs Red Acid, now known as REDuction, is mostly meant as a body building supplement, although can provide benefits to those who do not aspire to this goal as well. Controlled Labs does a lot of research and testing on the bioavailability of their products and Red Acid is no exception. It contains fatty acids and fatty acid analogues that help burn fat, reduce fat deposits in the body, and control appetite. It is an excellent product for weight loss, especially when combined with physical exercise. Controlled Labs White Blood contains arginine and ornithine ethyl esters, which are compounds of these supplements which are particularly well absorbed and utilized by the body. Arginine and ornithine are used for HGH release regimens as well as to boost nitric oxides in the blood (the principal action of Viagra, but White Blood does it without potentially harmful side effects). While the usual recommended dosage of plain arginine or ornithine to achieve these goals can be very high (as much as 10g at a time), White Blood performs the same function with as little as 3 capsules. White Blood is highly recommended since in addition to the amino acid ethyl esters it also contains antioxidants to decrease the potential of increased oxidation from the increased nitric oxide levels in the blood. Coromega Omega-3 Fish Oil is an excellent product for kids and for adults who do not like to swallow capsults. It is packets (90 to a box) of a high potency omega 3 oil and are either orange or chocolate-orange flavored, sweetened with stevia, and suitable for kids or adults who do not like to take capsules or find the taste of other liquid fish oils objectionable. They are strongly flavored of orange or orange-chocolate, but delicious compared to most liquid fish oils, even flavored ones. Country Life Biochem Aller-Max is an excellent full spectrum allergy supplement which contains some of the best allergy fighters in a single product of reasonable cost. Two of the main ingredients are cysteine and histidine, which are among the best supplements to control histamine response, along with supporting herbs and vitamins. See the Allergy Regimen for more information. Country Life Saw Palmetto and Pygeum Extract is among the best values for a capsule supplement that addresses BPH and other prostate problems and contains large amounts of both saw palmetto and pygeum extracts. Also useful as a DHT blocker for both men and women. See the BPH regimen for more information. Dr. Christopher's Sinus Plus Formula contains Brigham Tea, Marshmallow Root, Golden Seal Root, Chaparral, Burdock Root, Parsley Root, Lobelia, and Cayenne. It is a powerful sinus formula that provides both fast acting herbs to quickly combat the problem as well as deep acting cleansing and antiseptic actions. Not as fast acting as the horseradish mixture in Planetary Formula's Sinus Free, but it works on a deeper level. See the Allergy Regimen for more information. Eclectic Institute Para-Fight - formerly known as Eclectic Institute Black Walnut Wormwood capsules. Excellent antiparasitic but hard to find at a good discount. Contains concentrates of black walnut, clove, and wormwood with both annua and absynthium types. Does not stimulate elimination directly as do many antiparasitic combinations. Wormwood annua makes it more effective for blood borne parasites like spirochetes.This is Electroherbalism's top rated antiparasitic since it contains wormwood annua in addition to wormwood absynthium to make it more effective and the concentrates are produced in a safe manner without toxic solvents. Note that the new formula Para-Fight is not as potent as the old Black Walnut Wormwood and can be used at up to double recommended serving size to match it. See the Antiparasitic Regimen for more information. Concentrate of Black Walnut (juglans nigra) outer hull, equivalent to 400 mg of dry outer hull. Concentrate of organically grown Wormwood (Artemisia absinthium) flower & leaf, equivalent to 500 mg of dry flower & leaf. Concentrate of Clove (Syzygium aromaticum) flower, equivalent to 150 mg of dry flower. Organically grown Chinese Wormwood (Artemisia annua) leaf, equivalent to 700 mg of fresh leaf. NOTE: The Para-Fight formula which replaced Black Walnut Wormwood capsules is slightly lower in potency so more capsules are required to achieve the same results. Electroherbalism's Paranon has a similar formula to this Eclectic product but is only available in liquid extract form. Enzymatic Therapy Air Power - Contains guaifenesin, a plant-based expectorant used in many conventional cough syrups, in a base of mostly fenugreek and marshmallow root. Advertised to remove excess mucus from the respiratory airways due to bronchial irritations and it is excellent for this, especially when combined with an antiseptic program, and may be helpful against asthma, but the usual reason Electroherbalism recommends it is to combat snoring.See the Snoring Regimen for more information. Enzymatic Therapy AM/PM Menopause Formulais a comprehensive supplement for menopause, providing herbs and other nutrients to combat symptoms. It is top rated among users to combat problems better than other menopause formulas.. See the Menopause Regimen for more information. Enzymatic Therapy AS-Comp - Although made for asthma and allergies, this formula was good for its low dose (12mg) ephedrine content and respiratory support nutrients and herbs for sinus and other congestion problems. Ephedrine is one of the best decongestants but it is a potentially harmful supplement, and most products contain between 30 and 60mg per serving, so this is a way to get some of the benefits with less side effects. This product was discontinued as of 2002 and this information is provided for historical purposes. Enzymatic Therapy SinuCheck (see below) has similar action, but contains 30mg of ephedrine per servimg. Enzymatic Therapy Bromelain Plus - Bromelain is pineapple enzyme, which is an excellent antiinflammatory and digests protein, so typically good for muscle and joint problems like arthritis, gout, and other disorders where inflammation and undigested proteins are a problem, as well as some digestive disorders. More information on Bromelain in the Favorite Herbs section. Enzymatic Therapy adds some pantothenic acid and vitamin C to increase its effects, especially against muscle and joint problems. Advertised by them as "Enzymes to relieve muscle pain following exercise". It is sold in capsules and one of the only bromelain products I have found which is not sprayed with isopropyl alcohol after manufacture. Enzymatic Therapy Cell Forte with IP-6 - Inositol hexaphosphate and plain inositol in a 4:1 ratio is a patented formula. Dose for active cancer is 8 capsules twice per day on an empty stomach. Powdered form, available in cannisters, is usually more expensive than using capsules unless it's on sale. A premier cancer-fighting supplement, it is advertised to boost natural killer (NK) cell production but the main action in fighting cancer may be that it matures cancer cells so they are not embryonic and rapidly dividing and may cause cancerous tissue to revert to normal in some cases. Binds iron so can be useful in fighting some fungi, viral, and bacterial infections. Provides some cleansing of the liver and kidneys. Probably helps prevent kidney and gallstones. Can be made for oneself with pure powdered IP-6 and inositol, available from a number of manufacturers, mixed in the proper ratio.See the Cancer Regimen for more information. Enzymatic Therapy Curazyme - Excellent antiinflammatory and antioxidant with liver cleansing and artery repair properties. Recommended for many painful conditions, especially where extra protein digestion may be helpful, as in gout, arthritis, or other bone, joint, and muscle problems. Enzymatic Therapy DGL- DGL is a chewable extract of deglycyrrhizinated licorice (DGL) and the amino acid glycine. Glycyrrhizin can cause potassium depletion when used long term which is why licorice is typically deglycyrrhizinated when in supplement form. All good DGLs are in chewable form since DGL requires salvia to activate it into body ready form. DGL supplements typically come in both sweetened and unsweetened types, although most prefer unsweetened since DGL is already rather sweet. DGL stimulates the natural protective factors in the digestive tract, which often helps relieve stomach discomfort quickly. Enzymatic Therapy Doctor's Choice Eye Formula - Best eye supplement for macular degeneration, cataracts, and other degenerative conditions. Only widely available product which contains hachimijiogan, an herb blend used to treat cataracts. Now Eye Support has much of the same action and is quite a bit cheaper, but probably not quite as effective for cataracts.See the Macular Degeneration Regimen for more information. Enzymatic Therapy Doctor's Choice for Joint Health - One of the best arthritis supplements with 500mg of ET's stabilized glucosamine sulfate per dose, which many people who use GS on a regular basis say is the only GS worth the money. Unlike ET Doctor's Choice for Arthritics, which has a similar formula, this one includes boswellin, an excellent antiinflammatory and pain reliever.See the Arthritis Regimen for more information. Enzymatic Therapy Doctor's Choice Multivitamins - Has formulas for almost everyone, including men, women, senior men and women, male and female teens, pregnant women, etc. Contain extra nutrients and herbs which are usually helpful to the targeted group. Contain enough calcium and magnesium such that extra supplementation is not needed in many cases.The Prenatal Formula is excellent and highly recommended. See the Multivitamin Section for more information. Enzymatic Therapy Eskimo-3 - Molecularly distilled omega 3 EPA/DHA fish oil supplement comes in small gelcaps, unlike the uncomfortably large gelcaps most companies produce. 3 gelcaps provide: Omega3 Fatty Acids 600 mg: provides 260 mg EPA (eicosapentaenoic acid) and 165 mg DHA (docosahexaenoic acid). Eskimo-3 (also known as Prevail Eskimo-3) was one of the first widely available omega 3 fish oil supplements that was molecularly distilled at a reasonable cost. Today, any good EPA supplement is molecularly distilled or otherwise screened for toxic metals. See the EFA Supplement Section for more information. Enzymatic Therapy Krebs Cycle Chelates - The ET Krebs series are small mineral supplement tablets available in many combinations including ones with calcium magnesium.Enzymatic Therapy's bio-active minerals are chelated to the Krebs cycle intermediates (citrate, fumarate, malate, succinate and alpha ketoglutarate). These organic acids are responsible for energy production within every cell of the body. Minerals chelated to the Krebs cycle are better absorbed and utilized. See the Mineral Section for more information. Enzymatic Therapy Mega-Zyme - Non-acidic animal enzymes are among the strongest available with 10x potency instead of the usual 4x strength. Small tablets. Enzymatic Therapy SinuCheck - Very effective for sinus and other mucus congestion. Contains pseudoephedrine (30mg) so should not be taken long term but with the additional herbs, less is needed than with most ephedrine supplements so excellent for short term use as needed. NOTE: This low-dose ephedrine supplement was another casualty of the temporary FDA ban on natural ephedra products (but for some reason, not the high dose ephedrine products sold by drugstores and supermarkets like Sudofed) which lasted just long enough to drive off the more effective natural sinus and allergy ephedra products. Enzymatic Therapy Immune Strong Wellness Booster (formerly Enzymatic Therapy Thymulus) - Thymus supplement used primarily for immune stimulation, often part of a hepatitis regimen. Thymulus is sometimes combined with Enzymatic Therapy ThymuPlex to provide increased amounts of thymus fractions since ThymuPlex has too much zinc (which can cause stomach upset when taken in large amounts) to be used in therapeutic amounts by some people. 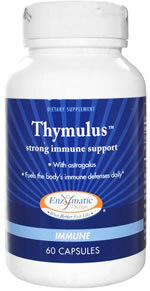 The astragalus root contained in Thymulus provides deep immunity stimulation but is also calming to the stomach. See the Hepatitis Regimen for more information. Note that there is another product similar to both Strong Wellness Booster and Thymuplex (see below) called Enzymatic Therapy Wellness Booster Plus which is a strong combination of the benefits of Strong Wellness Booster and Thymuplex. 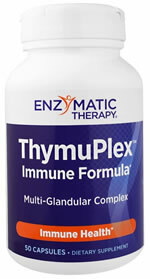 Enzymatic Therapy ThymuPlex - Thymus stimulation supplement used primarily for severe immune system dysfunction, plus hepatitis and other chronic viral problems. See the Hepatitis Regimen for more information. Enzymatic Therapy Thyroid and L-Tyrosine Complex (now known as Metabolic Advantage) provides thyroid glandulars, tyrosone, iodine, and other nutrients to stimulate thyroid and other endocrine gland functions in the body. This supplement probably works better than most prescription products for hypothyroid conditions. FutureBiotics Cholesta-Lo - Contains herbs, vitamins, and minerals and is one of the best single supplements to fight serum cholesterol and triglyceride problems for the money. Cholestatin is a phytosterol complex. Like other nutritional supplements used to fight high cholesterol and triglyceride levels, Cholesta-Lo has the benefit of improving liver function instead of destroying it. See the Cholesterol Regimen for more information. Futurebiotics Echinacea Immune provides echinacea with other herbs in a combination to stimulate immune system function. Excellent formula. FutureBiotics Pressur-Lo - Herb, vitamin, and mineral combination is one of the best single supplements to fight high blood pressure. Also includes a good amount of taurine and beta sitosterol - it is a good deal for the beta sitosterol (also known as phytosterol) alone. Excellent general circulation and heart health supplement even if there is not high blood pressure, plus may work in some cases to improve sexual dysfunction in men. Will also improve serum cholesterol levels if they are a problem. Usually available at an excellent price.See the Hypertension and other Heart and Circulation Disorders Regimen for more information. FutureBiotics Silymarin Plus contains a large amount of silymarin plus inositol, choline, beet, dandelion, alfalfa, black radish, etc. One of the only products which contains black radish and beet root powder together. 3 tablets per day serving size can be doubled if needed. Probably the single best supplement to remove both solvents in the liver as well as mineral deposits like gallstones. Using this for two weeks while drinking unfiltered apple juice and a tablespoon of olive oil before bed is likely as effective, and possibly more so, as a Hulda Clark liver flush.It is the top rated liver cleanser by Electroherbalism. See the Liver Cleanse Regimen for more information. .
Gaia Herbs Extra Strength Echinacea Supreme is one of the most powerful full spectrum echinacea extracts available, although like many liquid extracts, not rated for potency. Good quality echinacea can be told be how much it numbs the tongue. Gaia's Extra Strength Echinacea Supreme numbs the tongue more so than any other commonly available echinacea extract to the point of it being uncomfortable. Use small amounts of mix with water until one is acclimated to this sensation. There is also a regular (non extra strength) formula. Gaia Herbs Extra Strength Echinacea Supreme is Electroherbalism's most highly recommended echinacea extract. See the Antiviral Regimen for more information. Take 20 drops of extract in a small amount of warm water 2 times daily between meals. Gaia Herbs Hoxsey's Red Clover Supreme is a combination herb extract in the tradition of Hoxsey's alterative formulas for cancer. Good for deep cleansing and fighting chronic illnesses including cancer. See the Cancer Regimen for more information. Gaia Herbs Olive Leaf extract - Olive leaf extract is a premier antiseptic, effective against many bacteria, viruses, parasites, and fungi. Gaia's product is standardized for 10% oleuropeins, which is less than the 18% or more that many products offer, but it is extracted using water instead of toxic solvents so preferable for long term use. See the Antifungal General, Antibacterial General, and Antiviral General regimens for more information. Gaia Herbs Scudder's Alterative - This product has been replaced by Red Clover Supreme. The description provided by Gaia is "This excellent alterative compound was originally prepared according to Prof. Scudder's formula (an eclectic medical formula). It acts, as all alteratives do, to replace catabolic tissue with healthy, more vibrant tissue. This is an alterative second to none, working to bring about a repair to the vital force through the removal of obstructing waste material. Specifically indicated in liver and glandular afflictions, skin disorders, lymphatic and blood disorders, tumors, cysts, boils, carbuncles, cancers, endometriosis, and conditions where there is waste build-up and deranged tissue." Use it with The Water Cure and in amounts no more than directed. See the Endometriosis Regimen for more information. Garden of Life Living Multi Optimal Formula - Was once one of Electroherbalism's most highly rated multivitamins but since Garden of Life is now prohibiting their resellers from selling at good discounts, the high cost makes it lower rated for the money. Most Vitacost Synergy Multivitamins are much higher in potency and a much better value. Garden of Life Multi is mostly composed of "super green foods" bound to vitamins and minerals. Appears to be low potency, but due to the very high absorption rate, actually better than many supposedly high-potency products. Since everything is bound to protein or otherwise in a food matrix, it can be taken on an empty stomach. Although it appears expensive, especially considering the large daily serving size of 9 caplets, the amount of useful green food and herb extracts can save a lot of money over supplementing them separately. See the Multivitamin Section for more information. =HN (Homeostatic Nutrient)Complexes are vitamins and minerals that have been fermented with probiotic microorganisms and their enzymes. HN Complex vitamins and minerals contain all the necessary cofactors required for proper absorption and utilization, including enzymes, amino acids, antioxidants, probiotics, prebiotics, and organic acids. George's Aloe Juice is the purest aloe product available. It is fractionally distilled to remove the laxative and bitter compounds and tastes almost like water. A rich source of polysaccharides, aloe is often used to stimulate immune function and fight chronic illness in addition to its traditional use as a topical to treat burns and skin irritation. Excellent product to use for digestive illnesses such as Crohn's and IBS to control symptoms, but it is best to also use antiseptics to fight bacteria directly for these purposes. Many people use aloe juice to fight GERD and other acidic digestion problems, and it is helpful for this but only when taken in large amounts. See the IBS and Crohn's Regimen for more information. Health From The Sun Flax Oil Lignan Gold is one of the best flax oils products (Barlean's is as highly regarded). Both contain a large amount of lignans which are thought to be some of the helpful components in flax oils. Flax oil is a source of omega 3 oils, but unlike EPA fish oil must first be converted by the body to a useable form. Excess amounts of flax oil (3 TBS or more) can actually be harmful if there is not enough protein or other nutrients in the diet, but using 1 or 2 tablespoons per day is usually fine. Ingredients: 100% Certified Organic Flax seed oil and particulate with rosemary extract, mixed tocopherols (Vitamin E), ascorbyl palmitate (Vitamin C) and citric acid to protect freshness.See the EFA Supplement Section for more information. Herb Pharm Super Echinacea Root is not quite as potent as Gaia Extra Strength Echinacea Supreme, but not as expensive. Herb Pharm makes what are Electroherbalism's third most highly regarded widely available liquid herb extracts, after Gaia and Eclectic, but they still excellent full-spectrums herb extracts. See the Antiviral Regimen for more information. Ingredients: Organic grain alcohol (48-52%), distilled water & Echinacea Root extractives. Herb Pharm Super Echinacea is a capsule version of their echinacea root extract liquid and is also a full spectrum echinacea supplement. See the Antiviral Regimen for more information. Castor Oil is a powerful laxative and used as an emollient to soothe the skin and keep it moist. Pure, cold pressed, top quality oil. Good for use as a skin softener, although very thick. Edgar Cayce recommended castor oil packs over the liver to benefit the liver and digestive system and castor oil liver packs have become one his more enduring legacies with many people soaking flannel cloth with castor oil, placing over the liver area, and covering with a heating pad to increase penetration. Healers from many ancient cultures have used castor oil for over 3000 years. See the Castor Oil article for more information. To prepare a pack, saturate flannel and place over abdomen or other areas. Cover with plastic, and apply heat to increase penetration. Other uses; Massage into any area where softening and soothing are desired. Jarrow Formulas Glucose Optimizer is an excellent combination supplement to fight diabetes and other blood sugar problems. It is formulated better and generally a better value than Enzymatic Therapy's Doctor's Choice for Glucose Regulation (formerly Doctor's Choice for Diabetics). See the Diabetes Regimen for more information. Formula. Jarrow Formulas Jarro-Dophilus with FOS - Jarrodophilus is an excellent beneficial bacteria supplement useful for repopulation of the intestinal flora. Includes fructo-oligosacharrides (FOS) which may be as useful as the bacteria itself. Jarrow Formulas Mineral Balance - A very good mineral formula from Jarrow. Includes vitamins K-1 and K-2 to prevent calcium deposits plus MCHA forms of calcium and phosphorus and a good deal of trace minerals, although it is slightly low in magnesium.. See the Minerals Section for more information. Jarrow Formulas Omega Balance (now known as EPA-DHA Balance). The original formula called Omega Balance was the only widely available reasonably priced EFA supplement with a decent ratio of DHA/EPA to GLA (11:1). Still less than the ideal 20:1 to 40:1 ratio, but a lot better than the usual omega GLA EPA supplements which are in the range of 1:1 to 2:1, including way too much GLA compared to EPA for long term use.However, Jarrow has stopped production on this excellent product and the replacement is called EPA-DHA Balance,. It no longer contans GLA and CLA, only EPA/DHA (400/200mg). It is an excellent supplement for the money but it is too bad the old formula is not also made. It's formula is given below for informational purposes. See the EFA Supplement Section for more information. Jarrow Formulas Preg-Natal + DHA was an excellent prenatal formula that contained sufficient omega 3 in the form of DHA such that separate supplementation was not necessary. It was Electroherbalism's highest rated Prenatal Supplement. However, it has been discontinued. Rainbow Light Prenatal One is recommended as an alternative. See the Pregnancy Regimen for more information. Jarrow Formulas TLC 3.0 is an excellent heart and circulation formula in the Pauling and Rath style, although a far better value, and higher potency, than most other products. Like most, it is an effervescent powder which must be mixed in water, juice, or other liquid to let it bubble before use. See the Vitamin C section for more information. Life Extension Mix - A comprehensive multivitamin multimineral. Huge dose of 14 capsules per day (or 9 tablets, but don't use the tablets long term). Also available in powdered form, which is a good choice. Contains a lot of extras which may be useful for those who supplement a lot of adjuncts anyway, to save money and be more convenient by having everything in a single product. See the Multivitamin Section for more information. Natren Mega-Dophilus is the premier DDS-1 acidophilus on the market. DDS-1 strain acidophilus is the best type to fight overgrowth of harmful bacteria and fungi including candida and other yeast in the digestive tract. May provide some benefit systemically as well. Note that stimulating intestinal bacteria is the best way to increase vitamin B levels in the body for those who cannot tolerate normal B vitamin supplements due to their production with yeast fermentation, including those with candida and other fungal issues. Natrol SAF Stress and Anxiety Formula is an excellent supplement to fight stress and anxiety, especially considering it contains some calcium and magnesium, the first line supplements for these conditions and one often ignored in other stress supplements. See the Depression, Anxiety, and other Mental Disorders and Stress Regimens for more information. Natural Balance Happy Camper is an herbal blend made to fight stress by using relaxing herbs such as passion flower, kava, and lavender along with Siberian ginseng (eleuthero), plus some kola nut, a source of caffeine, so that it does not make the user sleepy. See the Stress Regimen for more information. Natural Factors Rx Omega-3 Factors is one of the least expensive high quality molecularly distilled omega 3 EPA fish oils capsules available. See the EFA Supplement Section for more information. Note that Vitacost Mega EFA is the same product as Natural Factors RxOmega-3, so look for the best price between the two. For those who do not like the large gelcaps of this product or the Mega-EFA, Vitacost has a new item called Mega EFA 2 which is the same product but in gelcaps half the size, so twice as many are required to get the same effect, but are useful for those who do not like to take large gelcaps. Natural Factors Turmeric and Bromelain - Excellent anti-inflammatory and antioxidant with liver cleansing properites. Recommended for many painful conditions especially of the joints and muscles. Helps digest protein, too. Can be taken up to double recommended for pain and inflammation. Good value for the money. Enzymatic Therapy Curazyme also includes turmeric and bromelain and is usually more effective, but way more expensive. Naturally Vitamins Wobenzym - Wobenzym is one of the most popular enzyme products in the world. Note that it is now manufactured by Mucos Pharma instead of Naturally Vitamins. Wobenzym is typically taken in large amounts by those with chronic and serious illnesses like cancer, but also for other inflammatory conditions such as arthritis, injuries, and circulation disorder. This may be why the most popular size of Wobenzyme is 800 tablet bottles. While Wobenzym is a good product, some think Enzymatic Therapy Mega-Zyme may be better. Mega-Zyme is in general less expensive, more powerful, and does not have a foul odor. Wobenzym comes in the original red color which is most popular in Europe and especially Germany where the product was formulated, and with clear coating, which was made for the US market who did not want the yellow-orange dye the red ones use. Note that Vitacost sells an identical product called Vitacost FlavenZym which is mroe economical than Wobenzym. Nature's Plus Nutri-Cal Hearts was one of the first good multimineral chewable tablets since it contains both calcium and magnesium in well absorbed forms. Excellent taste and enjoyed by children and adults, it is astounding that this is not a more popular product than it is and it can be hard to find. See the Minerals Section for more information. Nature's Plus Source of Life multivitamin - Contains pitifully small amounts of some nutrients like biotin, selenium, and chromium, but this is a favorite of many people who say it is a good multivitamin for improving energy levels. This is probably due to the large amount of spirulina (1g) plus octacosanol, sunflower and currant oils, ginseng, bee pollen, and other adjuncts. Available in iron-free formula.See the Multivitamin Section for more information. Nature's Secret Parastroy is an antiparasitic with laxative properties similar in formula to RenewLife Paragone, and both are good. Like Paragone, Parastroy is also a two part system. See the Antiparasitic Regimen for more information. Nature's Secret Ultimate Cleanse - Formerly AM/PM Cleanse. Excellent cleanser which addresses almost every organ especially the colon. It is a two-part system with two bottles. The Multi-Fiber part has some laxative components and can be used at night with the Multi-Herb part being used in the morning. Nature's Way Alive Multivitamin - A people's choice top rated multivitamin. Probably the best economically priced whole food multivitamin and like all the good ones, provides energy better than most multivitamins that don't have "greenfoods." The Alive! multivitamin formula appears to address the defects of the very popular Nature's Plus Source of Life multivtamin line (see above) by providing 100% RDA of biotin and a higher amount of whole foods and concentrates. Comes in tablets or capsules. Tablet form is usually a better deal and only 3 tablets are necessary for a full daily serving, but most people prefer capsules since they are easier to swallow. New Chapter Supercritcal Sinus and Respiratory is a powerful full spectrum sinus and lung formula. See the Sinus Infection and Allergy Regimens for more information. North American Herb and Spice Co. Oreganol Oregano Oil. - Oregano oil is one of the most useful supplements with the widest spectrum to fight bacteria, fungi, viruses, and parasites, and is also antiinflammatory. North American's oregano oil is widely available at health food stores.The standard product is diluted with olive oil to make it less caustic and can be taken a drop or two on the tongue at a time, or larger amounts mixed in water or juice.The Super Strengh Oreganol is more potent than the regular, and comes in a 1 oz size instead of the 0.45 oz size of the regular Oreganol. Note that oregano oil is also available in gelcap form for those who don't like the hot and spicy taste, but these small bottles provide the most potent forms of oregano oil in the smallest of packages making it ideal for travel, camping, and other activities where space is important. See the Antifungal General, Antibacterial General, and Antiviral General regimens for more information. 2 drops of either of these provide 50mg or a propietary blend of extra virgin olive oil and wild Mediterranean P73 oregano oil. Now Gamma E Complex is Electroherbalism's top rated vitamin E supplement. It contains high potency tocopherols including 300mg gamma tocopherol plus 400IU alpha tocopherol in addition to tocotrienols, which greatly enhance the antioxidant ability. See the Vitamin E section for more information. Now Ascorbic Acid is plain acid-type vitamin C powder of USP purity. Since it is one of the least expensive brands of USP ascorbic acid, it is often recommended by Electroherbalsm when ascorbic acid is called for. Very economical considering the 8oz side is 226g, equivalent to 552 capsules of 500mg each. Can be mixed with Ecological Formula's Tri-Salt Bicarbonates to make mineral ascorbates. Now sells a full line of ascorbic acid and other vitamin C powders including a 3 lb size of ascorbic acid powder, calcium and magnesium ascorbates, and C complex powders which include bioflavonoids,rose hips, and acerola. All are an excellent value. See the Vitamin C section for more information. Now Bone Strength - Good multimineral with MCHA (microcrystalline hydroxyapatite) forms of minerals, a well-absorbed type bound with phosphorus and similar to the type of calcium found in bones. Bone Strength is the same formula as Doctor's Trust Bone Builder with Boron. Since it contains some glucosamine, it is an excellent mineral supplement for those with arthritis and other painful joint conditions.. Now Bone Strength and Now Full Spectrum Mineral Caps (see below) are Electroherbalism's top rated multivitamins. Bone Strength contains an approx 3:2 ratio of calcium to magnesium while Full Spectrum Mineral Caps contains a 1:1 ratio, but does not contain glucosamine See the Mineral Section for more information. Now Bromelain is a 2400 GDU/g potency which is one of the highest natural potencies of this proteolytic (protein-digesting) enzyme available. While most enzymes are generally considered to be poorly absorbed, bromelain is one of the most bioavailable of all enzymes and has been the subject of numerous studies worldwide. Although Bromelain is derived from pineapples, supplementation is necessary to achieve optimum levels of this enzyme. Encapsulated in Vcaps® for a 100% vegetarian formula. 1 capsule provides 500mg of 2400GDU bromelain. Now Calcium & Magnesium is an alkaline type of calcium and magnesium, good for people who have an overacid digestive system. Normally the main components of inexpensive supplements like these, calcium carbonate and magnesium oxide, are not well absorbed but if there is sufficient (or too much) acid in the stomach, this can be an ideal supplement. Among the least expensive and efficient cal-mag supplements since only two tablets per day are necessary to get 100% or more RDA of calcium and magnesium. See the Mineral Section for more information. Now Coral Calcium Powder is one of the least expensive Okinawa source coral calcium powders available. The benefit of coral calciums is that they provide calcium in a high absorbable form plus are rich in trace minerals. The better quality coral calcium powder contain a good deal of magnesium as well. See the Mineral Section for more information. Now Curcumin is one of the least expensive turmeric extract supplements. Curcumin is one of the best single antioxidants and provides a number of other benefits including controlling inflammation on a par with prescription anti-inflammatories, including controlling COX-2 inflammatory enzymes, plus it has the side benefit of improving liver function instead of destroying it like many prescription drugs do. Also helps balance intestinal flora. Like other super antioxidants, one of the actions of curcumin is preserving vitamin C and E in the body, so it is a good idea to first ensure that adequate amounts of these are used before using additional antioxidants. Now Curcumin is Electroherbalism's top rated Super Antioxidant. Now Diet Support - Thermogenic diet formula has no ephedra as do most thermogenic formulas in the past, so is safer. Only two capsules per day dose, but should be taken in divided doses. Does have a bit of caffeine from the green tea extract, but not so much that it causes sleeplessness in most, and not nearly as much as most thermogenic diet formulas which add a large amount of guarana standardized for high caffeine along with the ephedra. It was designed by Dr. Balch and contains many of the best herbs and nutrients he recommends for weight loss in Prescription for Nutritional Healing.See the Weight Loss Regimen for more information. Bitter Orange Extract (6% Synephrine) (Citrus aurantium) 350 mg.
L-Carnitine (from 365 mg. L-Carnitine Tartrate) 250 mg.
Super Citrimax (Garcina Cambogia extract containing 225 mg. (-)hydroxycitric acid) 375 mg.
Uva Ursi (Uvae ursi folium) 4:1 extract 50 mg.
Green Tea Extract (Carmellia sinenis) 30% catechins 200 mg.
Now Eye Support - Balch formula good for most degenerative eye problems and excellent as an antioxidant for the eyes for maintenance. Often produces excellent results. The amount of zinc in 3 capsules is enough to cause cramping in some people, so only take one at a time if sensitive to zinc. See also Enzymatic Therapy Doctor's Choice for Eye Formula.See the Macular Degeneration Regimen for more information. Now Olive Leaf Extract - Olive leaf extract is a premier antiseptic, effective against many bacteria, viruses, parasites, and fungi. Now's product contains 400mg of 18% oleuropein for the best price. For long term use in serious diseases, though, it is probably best to use Gaia Herbs Olive Leaf extract (gelcaps) or Herb Pharm Olive Leaf Extract (liquid extract) since they are extracted with a water or alcohol method. See the Antifungal General, Antibacterial General, and Antiviral General regimens for more information. Note that Now makes another olive leaf extract and it has the same name, Now Olive Leaf Extract but has 500mg of 6% potency olive leaf extract and no echinacea. It is quite confusing and odd that Now would do this. They should call the product to the left Now Triple Strength Olive Leaf Extract to differentiate it from the 6% product. Echinacea Angustifolia extract 100mg, 4% echinoside. Now Silymarin 2x - Excellent value for double strength silymarin combined with dandelion root and artichoke extract. Now also makes a 1x Silymarin extract called Now Silymarin which contains silymarin in a base of turmeric powder and is also an excellent silymarin combination when taken in small amounts (up to double recommended) since too much turmeric powder can causing a burning sensation. Now Silymarin 2x contains no "hot" herbs in it though so can be taken in large amounts if necessary. Besides cleaning the liver of all manner of toxins, silymarin protects it, too. One of the first clinical studies on its properties was conducted on rats where half were fed silymarin then all of them were fed deathcap mushrooms. All the ones who had silymarin lived while all the ones without it died. Even so, it is not recommended to test silymarin's protective effects by eating poisons which are toxic to the liver! See the Liver Cleanse Regimen for more information. Now True Balance - A good economical multivitamin that is mostly noted for its large amount of biotin, it can be taken in double the recommended amount to make it a high potency multivitamin. Contains a bit of gymnema sylvestre to help control cholesterol levels and other liver nutrients including carnitine, choline, and inositol. See the Multivitamin Section for more information. Nutribiotic powdered vitamin C and mineral products are highly recommended but becoming harder to find. Nutribiotic DefensePlus - Nutribiotic Defense Plus is a strong germicidal supplement meant to fight viruses, bacteria, and fungus. It also boosts immune function to make it even more effective. An excellent supplement for cold and flu season. Effective even at the recommended dosage of 1 tablet three times per day. Nutribiotic Sodium Ascorbate contains vitamin C in the form of sodium ascorbate. This is better absorbed by many people, and is non acidic like plain ascorbic acid types of vitamin C. This may be the best type to fight viral and bacterial infections in some cases. See the Vitamin C section for more information. This entry is provided for historical purposes since it is hard if not impossible to find Nutribiotic Sodium Ascorbate any more. The link goes to Now Sodium Ascorbate, an identical product. Assists with Hemorrhoids, Fevers, Malaria. Kills Parasites and Bacteria. Hypoallergenic. Artemisinin (Qing hao su) is the active constituent of the herb Artemisia annua (sweet wormwood). This inconspicuous herb originated in Europe and Asia and has since spread to North America. It is now a common weed around the world. Test tube studies indicate that Artemisia can kill parasites and bacteria, supporting the traditional notion of using it for parasitic infections of the gastrointestinal tract. Both types of wormwood, artemisia annua (as in this product) and artemisia absynthium are both considered excellent antiparasitics but the annua type is thought to be better absorbed outside the digestive tract so more effective for blood borne illnesses. New research is confirming the use of artemisinin for diseases such as cancer and some think it may be a potent type of chemotherapy but without side effects. Nutricology is a highly regarded brand of artemisinin but Holley Pharmaceuticals makes what is considered the best although it is very expensive. However, Doctor's Best Artemisinin is manufactured by Holley so is also highly regarded and is among the least expensive. See the Antiparasitic and Malaria Regimens for more information. Nutrition Now PB 8 - PB8 is an excellent beneficial bacteria supplement useful for repopulation of the intestinal flora. Contains more strains of bacteria, including beneficial strep, than any other commonly available supplement. Proprietary Pro-Biotic Blend of 1200mg of rice maltodextran carrier plus 100% natural cultures of 8 strains of beneficial bacteria including Lactobacillus acidophilus. Planetary Formulas Sinus Free is a horseradish preparation meant to fight sinus and other congestion issues. Also fights viruses and bacteria which may have caused the problem in the first place. Does not taste as strong as the ingredients would indicate since the horseradish is not too prominent. See the Sinus Infection and Sinus Congestion and Allergy Regimens for more information. Planetary Formulas Stone Free - Good for stones and deposits of the liver, kidney, gallbladder, and bladder, with a similar action as FutureBiotics Silymarin Plus, but with more diuretic action, a little more antiseptic ability, and more geared toward removing mineral deposits in the liver, kidney, and gall while Silymarin Plus is better for fatty and toxic liver conditions. Stone Free's gentle formula contains a good amount of turmeric which provides antiseptic actions. Also reduces pain in the urinary tract with marshmallow root. Great formula for UTIs to remove the deposits which make them chronic. One of the best formulas when extra kidney and liver support is needed in preventing detox reactions.Can be used with additional magnesium and B6 when using for stone or other mineral deposit removal. Excellent formula for shoulder and upper back pain, which are usually caused by a congested liver. See the Kidney Cleanse and the Liver Cleanse Regimens for more information. Proprietary Blend 533 mg of Dandelion Root Extract, Ginger Root, Lemon Balm Leaf, Marshmallow Root, Parsley Root, Dandelion Root and Licorice Root. Promote Relaxed Calm - with standardized valerian and California poppy. Replenish Depleted Body Systems - with a high-potency B-complex and other nutrients to support nervous system health, essential for stress management and mental clarity. Rejuvenate Natural Energy - with nutrients plus adaptogenic herbs such as eleuthero and schisandra to help the body adapt to stressful environments. See the Stress Regimen for more information. Rainbow Light Nutri Stars Multivitamin & Multimineral Children's Chewable is an excellent chewable children's multivitamin formula. It is low in calcium and magnesium so these should be supplemented separately. See the Multimineral and Multivitamin sections for more information. RenewLife Digestmore - Non-acidic plant enzymes with herbs and glutamine provide healing properties beyond typical enzyme products. Good to use when taking antiparasitics. Formula. Could not find listing with quantities. RenewLife Paragone - Very good antiparasitic with laxative action. The addition of cascara or other laxative herbs in small amounts to antiparasitics makes them more effective, but they are not appropriate if elimination is already too frequent or loose. Two-part formula including a bottle of tablets and a bottle of liquid extract. Similar formula to Nature's Secret Parastroy, but Paragone is preferred by many since the high dose of zinc in the Parastroy, although adding to the effects, can cause cramping. Either can also be used for fungal infections. See the Antiparasitic Regimen for more information. RenewLife ParaZyme - Acidic digestive enzyme made to increase effects of antiparasitics, plus an excellent formula for anyone who need extra hydrochloric acid for digestion. See the Antiparasitic Regimen for more information. Solaray Cal-Mag Citrate and Cal-Mag Citrate with Vitamin D - Cal-Mag Citrate is a 1:1 ratio calcium magnesium supplement which is an excellent formula for cleansing. 6 capsules per day to achieve full dose of 1000mg each, but can be used at half dose. It is also available in 2:1 ratio with vitamin D, called Cal-Mag Citrate with Vitamin D, which is a good maintenance product. When Electroherbalism recommends Solaray Cal-Mag Citrate, it is always the 1:1 ratio formula. See the Mineral Section for more information. In a natural base of parsley, watercress, dandelion root, alfalfa. Docosahexaenoic acid (DHA) is an omega-3 fatty acid and functions as an important component of brain tissue. DHA plays a significant role in cerebral development throughout the life cycle, especially during fetal development and infancy. Pregnant mothers transfer DHA directly to the fetus, via the placenta, to support rapid brain and retina development. During infancy, DHA is also supplied to the newborn via mother's breast milk and is important for continued cerebral development. Some people have lower concentrations of DHA due to low-fat or vegetarian diets, which may provide inadequate amounts of this fatty acid. Supplementation with DHA can help assure adequate amounts to support normal development of the brain and retina. See the EFA Supplement section for more information. Since Jarrow TLC 3.0 and Alacer Pro-Lysine Ascorbs are no longer available, this is one of the few widely available vitamin C proline lysine mineral ascorbates products left. See the Vitamin C section for more information. Source Naturals' Pancreatin 8x is one of the most potent enzyme products available in terms of protease, amylase, and lipase per serving. Enzymatic Therapy Mega-Zyme is stronger per gram since it is 10x instead of 8x potency, but the Mega-Zyme tablets are about 170mg and provide 82,500 USP units of protease per serving of two tablets while the Source Naturals Pancreatin 8x contains 500mg per capsule and has 200,000 USP units of protease per serving of 2 capsules. However, some may prefer the smaller tablets of the Mega-Zyme even if twice as many are required, plus they are also rated for trypsin and chymotrypsin, which may be important for fighting diseases like cancer, and Mega-Zyme also includes a small amount of bicarbonate minerals, necessary for the best assimilation. The Source Naturals Pancreatin 8x may include trypsin and chymotrypsin, as do most pancreatin products, and there may be a lot - it is just not rated. Also note that the Pancreatin 8x provides much more lipase (the fat enzyme) per serving. TeamTrade Serovera is made for Crohn's, IBS, colitis, GERD, diverticulitis, and other digestive problems, as well as psoriasis, auto immune disorders, and CFS, et al. Serovera is a simlar product to both Digestinol as well as Molocure. All of these products are highly concentrated (1000:1) aloe extracts and contain only aloe mucilaginous polysaccharides (AMP), with some lecithin or glutamine. With an average cost of around 270 capsules for $159, they appears to be highly overpriced supplements. However, they contain 375mg AMP per capsule. Good aloe juice contains about 750mg AMP per liter, so each capsule is the equivalent of a half liter of aloe juice. Looking at it in this light, they are actually a good value. If this cannot be used due to the high price, George's Aloe Juice is a fractionally distilled aloe juice (all the laxative and bitter chemicals are removed), tastes almost like water, and is inexpensive. Many of the same benefits can also be achieved by using cultured cabbage juice which is very inexpensive to make. Note that Serovera has an annoying autoplay video on the homepage so turn the volume down before clicking. .
Twinlab Animal Friends Children's Chewable Vitamins Bunch-O-Berry is an excellent chewable children's multivitamin formula. It is low in calcium and magnesium so these should be supplemented separately. See the Multimineral and Multivitamin sections for more information. This excellent formula was unusual in that it contained equal amounts of calcium, magnesium, and potassium chelates.No longer available but information provided for historical purposes. Twinlab Daily Two - Good two-per-day multivitamin formula contains therapeutic amounts of vitamin A and beta carotene, vitamin E, selenium, and chromium.Available iron-free. See the Multivitamin Section for more information. Twinlab L Ornithine is recommended to boost nitric oxide potential in the blood and raise HGH levels for anti-aging regimens. Ornithine is used in the Liver Flush regimen to ensure a good night's sleep, and can also be used for this purpose when not performing a liver flush. It is typically taken in large amounts for most purposes, but one of the major benefits of ornithine is that less is needed for the same benefits for which arginine is typically used. Arginine and ornithine are often used together. Twinlab Paba is most often recommended by Electroherbalism to take when one will be exposed to the sun since it helps a bit preventing sunburn and other sun damage. Paba is also recommended in the Vitiligo regimen and in the Sunscreen article. Some assert it provides mental focus and energy, although it is not typically used for these purposes. Twinlab Pantothenic Acid (vitamin B5) is recommended in the Vitiligo regimen. It is also often recommended as a topical treatment for some minor skin disorders. Pantothenic acid, also known as vitamin B5, as well as the "anti-stress vitamin" is part of the B group vitamins and classified as a water-soluble vitamin. This nutrient can be manufactured in the body by the intestinal flora but plays an important role in the metabolism of fat, protein, and carbs, and in the creation of lipids. neurotransmitters, steroid hormones and hemoglobin. Multivitamins provide sufficient amounts and pantothenic acid is not often used separately. Twinlab Super Ascorbate C - Excellent mineral ascorbates formula is an effervescent powder that must be mixed in water or juice before use. Contains a lot of bioflavonoids. One of the few mineral ascorbates products that can be used in high dose vitamin C therapy and limiting to around 100% RDA of calcium and 135% RDA of magnesium for every 20g (20,000mg) of vitamin C. See the Vitamin C section for more information. Vitol Products Great Hair contains nutrients to improve hair as well as skin and nails. It contains a great deal of biotin, 3000mcg, as well as other helpful nutrients. World Nutrition Vitalzym is a vegetarian enzyme product which is advertised as high potency but does not state its potency. Nevertheless, despite its high price, it is a popular enzyme supplement for pain control, to improve joint and muscle flexibility, and to fight other effects of aging. It has a good deal of serrapeptase and protease (the first two ingredients) plus papain, bromelain, amylase (enzyme to digest starch), and lipase (enzymes to digest fat) along with amla (a berry rich in vitamin C) and the flavonoid rutin. Serrapeptase, like protease, is a proteolytic enzyme (digests protein) and not common in even vegetarian enzymes due to the high cost, which could explain Vitalzym's high price. Vitalzymes are also enterically coated to increase absorption. Until recently, Vitalzym was rarely available at a discount but it can now be purchased for $50 off the retail price making it around $110 for the large bottle of 450 capsules. 3 capsules provide 1500mg of a proprietary blend of protease, serrapeptase, papain, bromelain, amylase, lipase, rutin and amla.